First of all, I think it’s pretty safe to say that Birch’s play has one of the best titles I’ve ever seen. The question is whether it lives up to expectations. Brad Birch’s one act play shows how the monotony of daily life can kill you. Sure some people in a warzone somewhere are just happy to be alive, but for the modern metropolitan professional the reality we live in, a routine revolving around going to work to pay the bills and having no time left for ourselves, can be crushing. Birch’s script is slow to start but, once we begin to see the cracks in actors Joe Dempsie and Lara Rossi’s façade, the tension builds. The repetitive strain of silence Even Stillness sits upon is a brave directorial move from Nadia Latif; a device that could make the play drag is charged with a painful sense of nothingness by this subtle cast. Dempsie’s descent into baseness is excruciating to watch, and Rossi balances the volatile and vulnerable aspects of a character that is evidently being pulled in two directions at once. As Dempsie and Rossi realise that all they want in the world is one another, the chemistry between them fizzles and the play really begins to move forward. So Dempsie and Rossi stop going into work, they stop paying the bills, and in a sexually charged moment of madness they destroy all their pointless belongings and begin to live in a pit. Forced to eat paper. This very normal play takes a very surreal turn, and you believe in it. 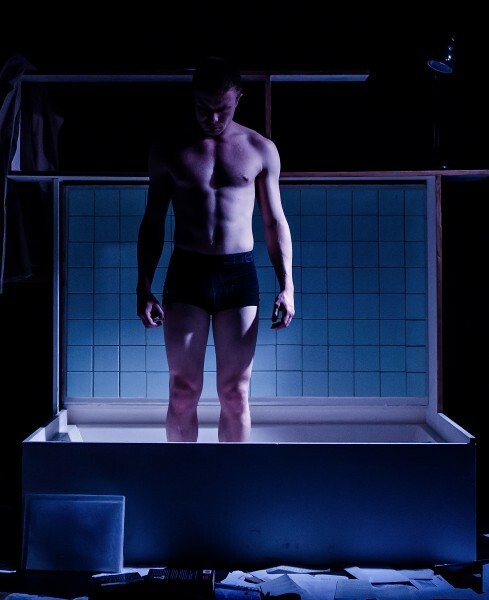 There is something terrible which rings true about Birch’s play, it’s almost like a modern day Waiting for Godot – although the similarities lie more in the silence, than in the average dialogue which makes the occasionally inappropriate advance into the world of poetics. In a similar vein, Simon Slater’s sound is constantly playing beneath the action, and adding very little it simply becomes an irritating drone in the background. The characters of Even Stillness float in a little world of their own which we’re all familiar with, but which is very much their territory. Birch’s script and Latif’s direction occupy something of a sacred space together in the Soho Theatre upstairs, and it’s worth peering in from the fringes before they disappear.